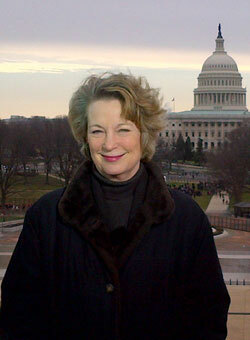 On Monday, June 14, 2010, Susan Eisenhower participated in Newsweek’s Executive Forum at the National Press Club. The forum, entitled “2010 Global Energy Connectivity: How Climate and Energy are Driving U.S. Policy and Perceptions,” was moderated by Newsweek Deputy Editor Rana Foroohar. Roxanne Decyk, executive vice president of group governmental relations for Shell, delivered opening remarks. Eisenhower, part of a five member panel, was joined by Senator Mark Warner of Virginia, Congressman Cliff Stearns of Florida, Congresswoman Sheila Jackson Lee of Texas, and Newsweek Contributing Editor Eleanor Clift. The panel discussed a wide range of issues pertaining to energy policy in the United States, which has become especially relevant in the wake of the Deepwater Horizon oil disaster. The panelists discussed the pertinence of energy independence, the importance of diversification in the nation’s energy mix, and the need to better educate the American public about energy.